Olivia of What Olivia Did.. I have been away from blogging a while, feeling rather un-inspired and a little lost but alas I am back… I wanted to share with you an illustrated version of my favourite inspiring bloggers the ones who has helped me out of my rut and spurred me on. This will be running all week a different blogger everyday…enjoy! First up is the ever inspiring and truly beautiful blogger Olivia who can be found over at what Olivia did, last week I actually finally got to meet her at the Cosmo blog awards and she is just as beautiful in real life, and can i just say hilarious. Her blog is mainly fashion, which i love and her photography is beautiful. Her recommendations on Paris when me and Lyzi went on our adventure were invaluable, if it wasn’t for her we wouldn’t of gone crazy in the Kilo shop buying vintage galore. Part one and two here. When I read her posts I want to just hang out with her and constantly take her photo, i am aware of how creepy that sounds but there is just something about her style that is wonderful. 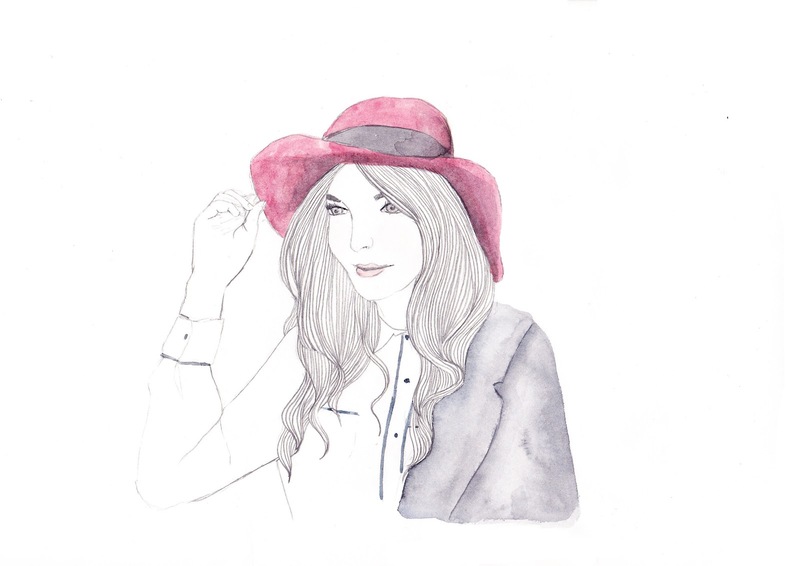 From reading Olivia’s blog it has made me want to be far more adventurous with what I wear, I now what to wear lots of beautiful hats and red lipstick! What have you done to me Olivia?! If you haven’t already fallen in love with her then i suggest you take a look for yourself…enjoy! Often I feel the same for a blogger. It's not creepy, it's normal. Or well, I hope it's normale. Otherwise, we can be creepy togheter!! What a lovely, lovely post. I think it is just wonderful to share inspiration and admiration for other Blogger's. I am all for the sharing part of this community. This is beautiful <3 you're far too talented! When people draw, it makes me so jealous of their talented skills.. it makes me feel a bit like HMM I don't have a talent. I love Olivia's blog and have been following her for a while. I love watching how she styles her outfits and look forward to reading her posts. Ella you're so talented! Your illustrations are gorgeous lady. Ella you did a brilliant illustrations. You've really got something and its fraction is observed over here. You’re smart.